Add a touch of beauty to any business entrance or walkway with these classically shaped square concrete planters. 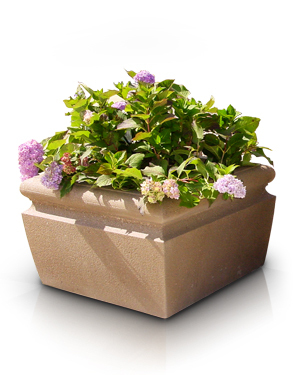 Steel reinforced and weather resistant, concrete planters are perfect for year round outdoor use. These heavyweight planters are strong enough to support even large root systems, and their substantial weight naturally discourages theft and makes them great security barriers. These planters are so versatile they can be used to enhance state and government agencies, fast food restaurants, department stores, parks, and recreational departments or can simply be used in residential areas to beautify home gardens, front lawns or backyard landscapes. Available in multiple sizes to fit any space. All planters come standard with drain holes for proper drainage. Available color options and finishes shown below.